Waterpocket Distillery® is named for the Waterpocket Fold in Capitol Reef National Park, a quintessentially Utah landscape and a national treasure. A wild and remote place, it attracts adventurers prepared to step away from the safe and ordinary. We invite you to leave the everyday behind and come to a place where your tastes are challenged with wilder flavors and unexpected discoveries. In our research, we've discovered a rich vein of pre-Prohibition herbal spirits, bitters and LONG LOST™ liqueurs. We intend to mine these recipes for flavor gold. Our motto is OPEN WILD™. Prepare to be challenged and delighted. Our double pot still system forms the heart of Waterpocket® Distillery. They were custom crafted for us by Mueller, a small family firm in the Black Forest region of Germany. Energized by steam from our Columbia steam boiler, this professional system shapes the character of the spirits we produce. Our large pot still (nicknamed “Witch”) primarily handles our rum & fermented products workflow. It has a capacity of 500 liters (about 130 gallons). Crowned with the distinctive spherical Mueller helmet and connected to an “Aromat” technology column with a large dephlegmator and 2 plates, it produces a distinctive spirit of high refinement and concentrated flavor. 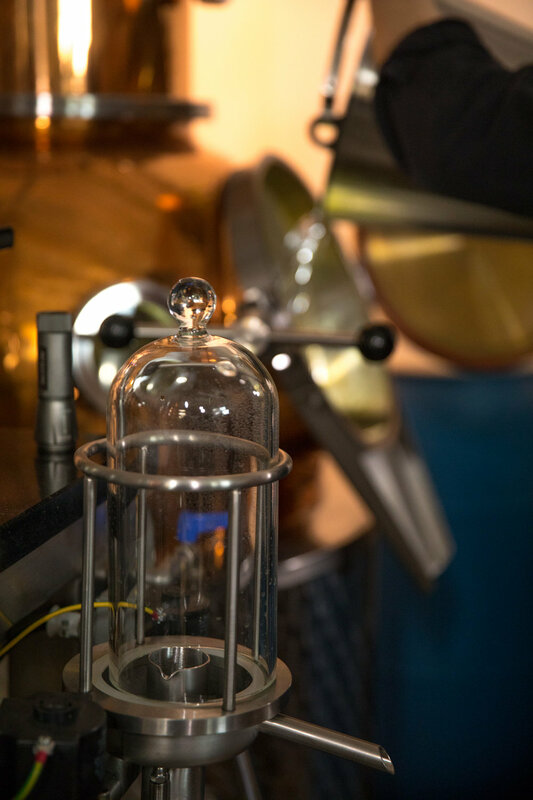 Our small pot still (nicknamed “Warlock”) is used for our botanical liqueurs, gin, and other small batch products. It’s about half the size of the larger still, coming in at 230 liters (about 60 gallons). Equipped with an “Aromat” column attached directly to the pot, it is reminiscent of older “carter-head” stills, with the Aromat section taking the place of the plates. The Aromat section of the columns contain a copper spiral which forms an ascending channel with an average length of 10 meters. A powerful dephlegmator is arranged above this channel. The effect of this is a constant exchange of material between the upward-rising steam stream and the down-flowing phlegm. Thus the rectification level can increase & produce an extremely delicate, wide-bodied aroma in the distillate. Both stills have integrated distillate separators, dedicated high-efficiency condensors, integrated CIP (cleaning-in-place), and receiving tanks. A dedicated control system allows fine on-the-fly control of condenser & dephlegmator temperature, steam pressure, distillation separation, in addition to continuous monitoring of distillation data points. 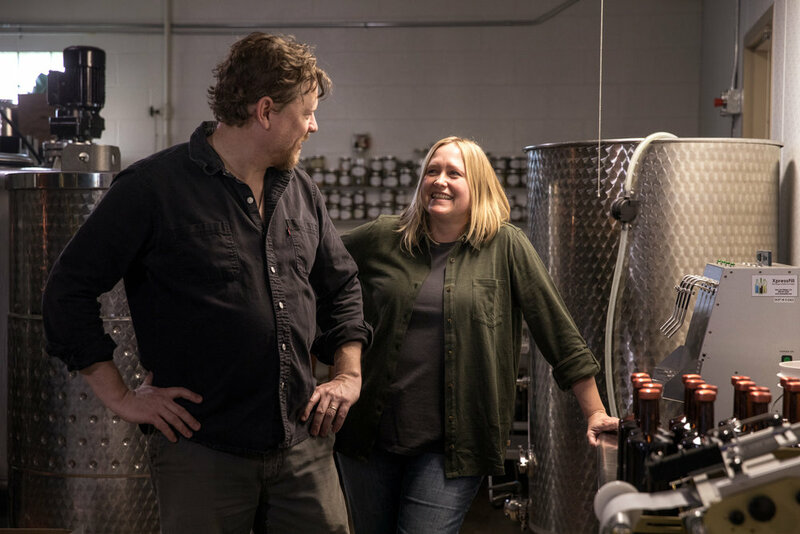 We are Julia and Alan Scott, and we are Waterpocket® Distillery. We hail from the Midwest, but have lived in Utah since 2000. We have lived overseas, including long stays in Spain, Hungary, Slovakia, and China. Our culinary scrapbook includes the taste and aromas of dozens of spirits, mostly unknown in the U.S. Now that we’ve set down roots in Utah, our vision for the distillery had to include the beauty of those once-exotic flavors. We began this distillery project four years ago, but you could say we’ve been working in the skills all our lives. Julia has worked professionally as a chemical engineer in distillation processes for two decades, when she wasn’t getting a PhD in biochemistry. Alan started fermenting as a hobby in college, starting with beer, but adding wine, mead, and pickling to the skillset over time. 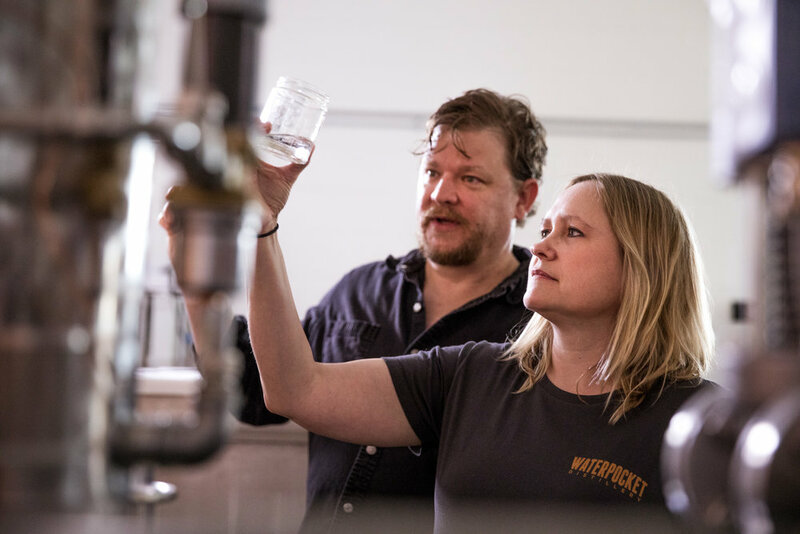 Our balance of technical and creative skills makes Waterpocket Distillery possible. We invite you to join us on this journey of culinary adventure. We sincerely believe that spirits are best enjoyed when hearts and minds are engaged with the senses in the pursuit of flavor. Our goal is to make spirits as wild, untamed, and fascinating as the Waterpocket Fold itself. Enjoy the journey!